Are Board Games Getting Lighter? People love narratives. We love not just the narratives we get in the form of designed stories in books and TV and movies. We love making narratives full-hog out of nothing. If we see even the slightest hint of a pattern, we instinctively turn it into a causal relationship built into the very fabric of the universe. I’ve written about this before when talking about cognitive biases to avoid when playing board games. So many of those fallacies stem from our tendency to try to fit everything into a causal story. I have formed a narrative in my mind about the state of board gaming in 2017. It goes like this: Eruogames made it big in America starting with Catan, and most games were at about that level or lighter by that point. Wargames and train games were the heavier, more niche fare. Puerto Rico heralded a trend towards heavier eurogames in the early/mid-2000’s, which peaked around 5 years ago and has diminished since into lighter games in the 45-to-60 minute playtime range. But that’s a narrative I’ve formed through loose observations about what games I keep seeing and how it seems like there aren’t many heavy euros anymore. I wanted to test it, so came up with an, admittedly, rough method. 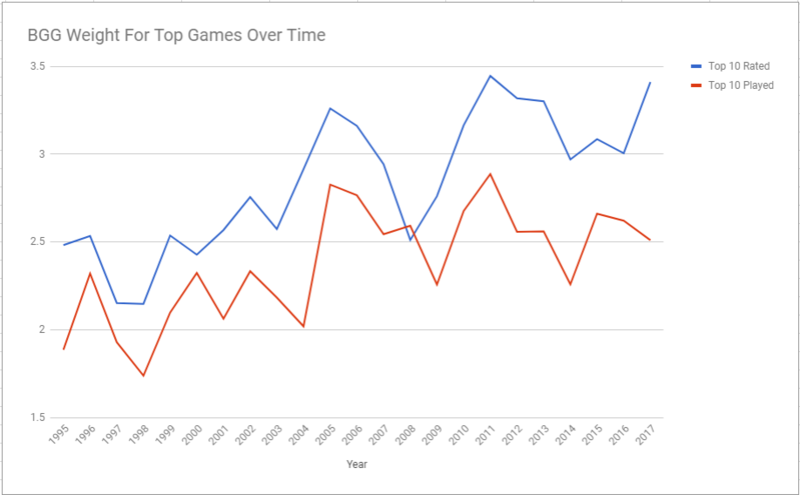 I went to BoardGameGeek and, starting with 1995 (the year Catan was released), charted the weight rating of the top 10 games by “geek rating”, which gives a decent indication of a general perception of quality. I also charted the weight rating of the top 10 games by number of ratings, which gives a good indication of popularity. Geek rating itself is average score weighted by number of ratings, so I’m pretty sure I’m committing some kind of statistical sin with this, but it’s good enough for me. And now I’ve got to face the fact that the narrative I’ve formed in my head seems to be wrong. The most popular and most well-received games by people in the hobby (i.e. people who rate games on BGG) gave generally trended upwards, and whatever short-term trends we might try to see, like a downward trend after the peak in 2011, are dwarfed by the larger trend of slowly moving upwards. I was correct that games got heavier in the mid-2000’s; that’s where the average jumps from about 2.5 to about 3 (except for the odd dip around 2008). Indeed, 2017 has the 2nd highest average among the top 10 rated games. How did I make this mistake? I think the answer lies in what I’ve been exposed to. Before the last year I was looking at games and immersing myself in games news primarily to search out the kind of games I might want to buy or know more about. Namely, mid-weight and heavier games. Since starting The Thoughtful Gamer I’m trying to keep more abreast of general gaming information, and I’m part of a number of general board game social media groups to that end. Most games created have always been lighter, simply because they’re easier to make, and I’m seeing a lot more of those now than I ever have in the past. This has changed my perception of what people are enjoying the most and what people are actually playing. However, there are a number of limitations with my research here. First, games are more popular now, which means there are more ratings for newer games than there are for most of the top games in 1995, so ratings for newer games are going to tend towards their actual raw rating, and the moderating effect used to create the geek rating will have less import on them. Second, since board games have become increasingly popular, many ratings are going to be backwards looking. I’m willing to bet the majority of people who rated Catan didn’t play it in the 90’s at all. I’m not sure how I’d effectively capture what people thought of games back when they were released. Even if I looked up very early BGG numbers with an internet archive, that wouldn’t account for the very real possibility that people are generally more favorable with their ratings now than they were back then. I did a quick test of that theory by comparing games with their newer editions. Both Through The Ages and War of the Ring have increased weight ratings of about 0.2 points between their two editions (which are very similar). Curiously, Twilight Imperium dropped 0.1 point between its 3rd and 4th edition. One could argue that’s due to the streamlining in that new edition, but Through the Ages was also streamlined, so I’m not sure what’s up there. Third, my sample size is quite low. 10 games from each year isn’t a lot, but I wanted to try to capture a snapshot of only the games that people really played that year. 10 is safe to secure that in the early years, but it quickly becomes laughable in the later years when all 10 are in the top 150 or so overall. The solution to this is probably to use all games in any given year that have a particular number of ratings. However, that’s a much larger project that would take a good amount of time. Perhaps later I’ll run those numbers to see if anything changes. For now I’m content using this very basic information to re-calibrate what I think about the board game hobby in 2018. I find these exercises very helpful in reminding myself that cognitive biases are real and that I should remain humble about things I don’t actually know about.